Tomorrow the Auckland Transport board meet again. I’ve taken a look at some of the key reports to hopefully find some interesting information. The business report contains a lot of the little details that allow us to see what’s going on. As usual I’ve pulled out some of the aspects that caught my attention. New HOP Website – In their June meeting, it was reported that AT were hoping to go live in late August with a rebuild of their HOP website which they say will deliver better functionality for customers. This now appears to be delayed. The AT HOP Web Rebuild project remains at a Red status due to ongoing technical interface issues with AIFS technology which has been hindering the completion of Integration testing. An independent architecture review of the solution has been carried out and the report findings have been accepted by both BT and HOP stakeholders. Following the findings of the report stating that the core code should be able to be fixed, it has been agreed that a time-boxed piece of work (6 weeks) shall be undertaken by Thales with support from AT vendors and with independent oversight to drive forward fixes to the core blocking issues, which should bring resolution. Automated Bus Lane enforcement – Earlier in the month we reported that AT had implemented some automated bus lane enforcement on Fanshawe St. It appears this is actually a trial so hopefully we’ll see it rolled out to more bus and transit lanes in the future. Following discussions with the Human Rights Commission around passenger information being made more readily available to visually impaired customers, AT have a proposed roll-out of “next service” and “platform” information audio announcements at all rail stations, and “next stop” audio announcements on all busses, as part of a rolling programme. Work is now underway to scope this out and plan the implementation of a suitable solution. Passenger Kilometres Project (AT Metro) – Computing average kilometres for different journeys based on Zones. This provides the average kilometres for different journeys based on stages. This calculation picks up a journey, and calculates the distance travelled based on a distance sheet entered into the system by AT Hop team. Lincoln Rd – AT say they have obtained a designation for their plans to supersize Lincoln Rd while the NZTA has also approved funding for detailed design and construction. However, the project page on AT’s website says that construction isn’t due to start till 2023 due to funding constraints. Eastern Busway (AMETI) – Hearings on the Panmure to Pakuranga section are scheduled for September. September will also see AT award a contract to design and consent the remaining parts of the busway from Pakuranga to Botany, including the Reeves Rd Flyover. City Centre – Despite even more disruption in the city centre, such as the Watercare works on Halsey St (which has been terrible for PT users), travel time for vehicles at the six monitored sites required as part of monitoring the City Rail Link works shows that most routes continue to perform better than before the works started. Albany ParknRide extension – really, another extension, where? Bus Priority Lane – Hour Modification – It appears AT are finally going to extend bus lane hours. It also appears the Sandringham Rd lanes have been changed, presumably as part of this. All seven of the Resolution Packages have been awarded. Approximately 60km of bus priority lanes are impacted by the change in operational hours. The first of the draft resolution plans and reports have been received for the Onewa Road T3 lane and a portion of Remuera Road. The Albany Highway resolution amendment report has been drafted internally and is ready for submission for TCC. However later in the report it notes this, suggesting that parking will still be a priority in some places which is absurd. Double Deckers – A lot more routes will eventually get double deckers, here’s a list of routes and expected times. Glenfield 973 / 974 – complete except for Chorus cable undergrounding – Est completion July 2017). Gt Nth Rd – go live 20th Aug 2017, trials scheduled. 881/NX2 – go live late 2018. Manukau Rd – go live April 2018. Mt Eden Rd (legs for future 27a & 27b) – physical works planned for July 2017. Dominion Rd – go live June 2018, project clash with cycle project on Ian McKinnon Dr that reduces south bound traffics lanes to 1 x lane – creates DD conflict with approx. 25 trees – Alternative Express routes under investigation. Additional Bus Lanes – AT were meant to deliver 11km of bus lanes last financial year (to end of June) as part of a 40km programme over 2015-18. However, they only delivered 7km meaning that they’re going to have to play catch up this year. The do say that a lot are in design though which will be needed as the result means they’ll need to complete around 16km this year. They also note they’re working on a 10-year programme of new bus lanes across the region to support the New Network. Is there anything else you noticed in the reports? I thought the plan was to move the Auckland port to another location. It appears it is now just downsizing as even more goods are being handled at the port of Tauranga. Crazy to extend P&R, better to charge for use of it or increase bus collector services to it. Seems problem is that the general public ask for more parking. There is no plan to move the port, certainly not by the port company, just some concepts about maybe doing something in a few decades time. This I hope is poor reporting by Orsman, my understanding is that the carpark is a facility to store cars being unloaded to replace the acres and acres of open parking they do across the finger wharves and the bledisloe terminal currently. So that should make the port have less footprint but be more efficient. I think the hotel on top is just a way to recoup a bit of the cost. You would hope they build the parking structure with level floors and a proper stud height (I think thats a requirement now), so that in the future most of the parking levels could be converted to more hotel or other uses, if the port did shift or further consolidate. That’s pretty much what the article said – the carpark would be to take them off the other wharves and would be built so as to be repurposed later. With the port not moving anytime soon, that’s not a bad result if CCW and Marsden wharves have public access. Grass them. Are the Dom rd busses going to be centre running? Why else would the ian McKinnon cycleway cause conflict with trees unless they had planned to use the centre lane, and what about the conflict with shop covered pavement that have historic protection? 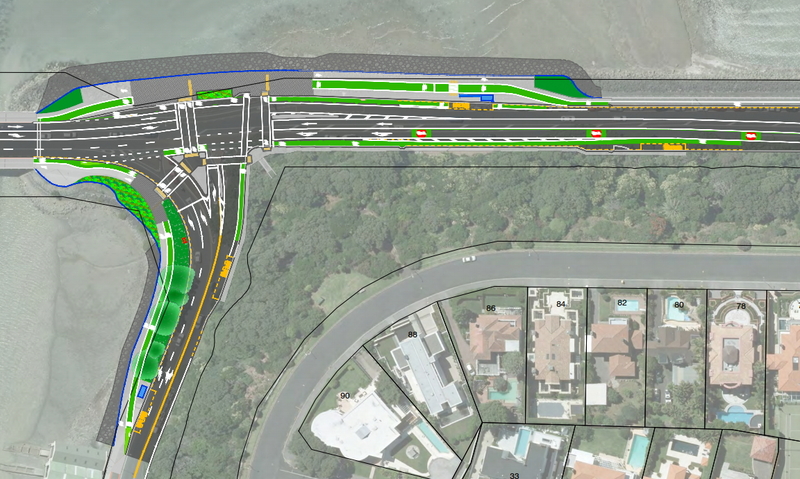 The cycleway is being built on the roadway, replacing one of the four lanes. This means only one lane heading out of town, which means buses would be forced to use the kerbside lane next to the trees, rather than using the soon to be non-existent second lane in the middle of the road. Easy solution, put a cycleway on that side too! As much as I’ve given AT a hard time over the years for being so slow, shouldn’t they wait until after the elections before doing anything to Dominion road? Labour are promising light rail aren’t they? Light rail, even if signed off tomorrow, would take a couple years to deliver. Also if you build light rail in the centre, this means that all vehicles (including trucks) would need to use the kerbside lane. So all the clearance work you’d do for double deckers, you’d have to do with LRT anyway. More reallocation of trees instead of road space. Trees are not just street furniture, AT. Goff, this makes a mockery of your tree planting programme. From memory those trees aren’t that big on Ian McKinnon. Isn’t it a pretty trivial branch prune that would be required? Manukau Bus Interchange has been a complete joke. Over-sized, not fit for purpose, hugely expensive, no TOD apartments/offices on top and also really really late. Good to see Bus Lane times change but still think 3-7 rather than 4-7 to pick up early start/finish workers and students. They also need to investigate some routes which have counter peak movement especially Citybound in the evening so wonder if in evening peak some routes should have bus lanes operating both ways. They also need to investigate some routes which have large numbers in during the middle of the day such as EPH/Eastern buses where they are full even at 12 sometimes. They don’t necessarily need the full bus lane but at least bus advances at intersections. Yes pity that bus interchange has nothing on top. The best thing they could do for EP Highway buses is get rid of the indented stops city bound. They should just be in the lane as the are on the other side of the road, this means the bus doesn’t have to pull out into traffic. Have been saying we should have announcements for a long time. London does really well with this. The only issue is that they do need to be calibrated so that they aren’t too loud and annoying. The KISS principal applies – no need for things like Kia Ora or for someone who sounds like a bus driver lol. Have someone who can speak properly in a pleasant easy to understand clear voice with simple announcements at a reasonable volume (not too loud). Press the green button when lit. People learn to open a door at an early age and we don’t need to be told over and over, daily, year after year. You say that. Until you are standing at the door waiting to get out and the guy in front of you does not push the button. Then the train slowly pulls away and you are still in the train. Was not a good day. Oh dear, that does bring back a memory from some city that was new to me and I was being a similar buffoon… don’t think anyone actually missed their stop but memory’s a bit fuzzy… I wonder if the “mind the gap” woman sometimes says those words as a party joke. ‘Kia ora’ might actualy be just the length required to allow people to register that information is coming. Certainly we don’t need ‘Good Day, customers. Auckland Transport is pleased to bring you this customer sevice announcement’ or equivalent. And volume is crucial – good point. There’s way too much over amplification in our lives. I’ve noticed some bus stop info machines need repair: When internal moisture is fogging the screen and the audio button doesn’t work, it’s pretty hopeless for everyone, regardless of sight and hearing levels. The new bus lanes on May road have the same hours as Sandringham. Pity they built it after Waterview is finished and there is almost no traffic now to warrant it. To the contrary. Right now is when lots of road needs to be reallocated. Even NZTA’s fugures show a huge increase in traffic expected over the next 10 years. They incorrecty also assigned this traffic to the Do-Min option too, but that’s another story. Reallocation of road space now while the traffic volumes are lower on the surrounding street network is about the only thing we can do to try to prevent some of this growth in traffic, and public resistance should be lower right now, too. The rate of increase in traffic is highest immediately after road expansion – the sooner the road allocation occurs, the better. Yes reallocation is the real key not just morenof everything. Hence Lincoln road & new areas south and north west. The one hour pm bus lane extension is absolutely at the WRONG end of the slot – whoever decided this should drive around a few burbs at 3:15pm and see just how lively things are out there. Now I suppose we’ll have to wait another five years…. It’s the school pickup hour, good reason to NOT extend the other way if it was just a T2/3 lane as it would encourage kids getting driven around too much. Any word on whether AT are going to charge for this new park and ride in Papakura? Diesel same type as double deckers being rolled out on the other routes. As NZBus seem to be going with BCI instead of ADL now (you can see ADL one in background for comparision). But in terms of diesel/hybrid/electric, pretty sure still diesel. Which is still more environmentally friendly than a bunch of petrol SOV’s. A somewhat grumpier face on those ones…. But the acrobatic bars up the front look fun. I cannot understand why busses are not hybrid. With hybrid excelling in stop start urban driving, surely the small purchase premium would be soon repaid in diesel savings. Certainly they seem to be the tool of choice for taxi drivers. Yes Hybrid would make sense. I wonder if perhaps weight is an issue since the DD are already classified as a HGW vehicle. Hybrids (or rather the batteries) tend to add a decent amount of weight and depending on the configuration duplication of motors can also further add to weight. Ideally with a bus hybrid you would have electric motors driving the wheels with a diesel generator powering them and the battery pack. In general use probably not too much benefit however in the city itself or when idling at stations etc a hybrid would be more more pleasant for passengers and people nearby (not to mention the environment). I’ve brought this up to the AT Twitter but they won’t answer. Their new PT app is only available for Android 5+. So I have to spent $100 on a new smartphone or I have no PT app by the end of the year. Screw that. Dymajo is a good alternative that should work on older devices. You can upgrade to android 5 or 6 by installing Lineage OS on most phones that aren’t really old. Works better than stock Samsung android on my S4 mini. That’s what I finally did when I couldn’t install the new AT app. Nothing about progress with the CRL? Doh!, forgot the CRL development was removed from AT and is now with a new company the CRLL, apparently for crucial yet unexplained reasons. Can we expect to see reports from CRLLagendas for board meetings? I strongly suspect all we will get is the sanitized positive spinning informationless fancy graphics web page updates. Have they announced the directors yet? I was under the understanding that CRLL was supposed to be independent of either party, therefore avoiding concerns about carrying an agenda or political interference. With regards to the Manukau Bus Interchange, what is the latest on Auckland’s inter-regional and long distance bus/coach terminal for InterCity Group (InterCity Coachlines, Great Sights and Grayline) and Mana/Naked Bus? When they are building additional carpark buildings for Papakura and albany Park & Ride, can they consider to have the first floor retail and hospitality? It would be a very bad outcome if the whole area are just carparks and nothing else. Yes very good point. That would make a big difference to walkability and aesthetics. It could even be mixed with light industrial and housing. Still no news on NW busway. I wonder what happened to that business case. Hi folks. You are still showing the prehearing design for Ngapipi, rather than the improved version which got approved. Got a link to the correct one?